In the fall of 2011, Elizabeth died in a freak plane crash. Most of the country forgot very quickly about this crash, though, a few weeks later when airplanes went from being something that might mysteriously crash once in awhile to things that could be used as human-filled missiles. Of course, Elizabeth’s family didn’t forget, and neither did her best friend, Kate. Between Elizabeth’s death and the 9/11 attacks, Kate is anxious in a way she had never been before, obsessed with all of the things that could unexpectedly go wrong, and trying to be prepared for them and for her family’s safety. Now, the summer after that horrific fall, Kate discovers that Elizabeth willed her her entire collection of journals, for Kate to do with as she sees fit. Elizabeth’s only request is that Kate start at the beginning. Elizabeth’s husband Dave, however, resents the bequest, particularly as a glimpse at Elizabeth’s last journal after her death led him to believe that she was not on her wait to a painting clinic, as she claimed, but to meet a lover. Now Kate must decide what her obligation is to Elizabeth and her memory and come to terms with the fact that she may not have known Elizabeth nearly as well as she thought she did. 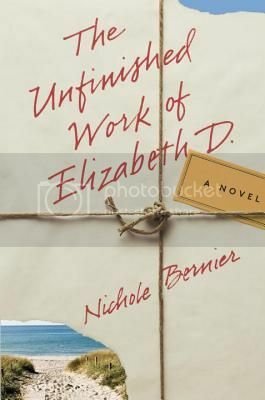 The Unfinished Work of Elizabeth D. is a beautiful and well-plotted debut novel. Bernier weaves Kate’s story together with Elizabeth’s journals flawlessly, allowing the reader to understand how this summer of Elizabeth’s journals helps Kate better understand not only Elizabeth, but herself as well. Kate is a very genuine character, real and flawed and very sympathetic. Her fear and pain make you want to hold her and tell her that everything will be alright, and yet she never crosses the line into obnoxious or pathetic, instead she continues to be someone with whom you would wish to spend time – which is good, because you have some 300 pages to spend with her. What really makes The Unfinished Work of Elizabeth D. worth reading, though, is the tension between the person that Kate believed she knew, and the person she is discovering in Elizabeth’s journals. How much of the disconnect is because of the face Elizabeth chose to present, and how much of it was Kate simply seeing what she wanted to see? This and similar questions make the novel bigger than simply Kate and Elizabeth’s stories, and spark questions relevant to the reader’s own life. As such it would make a wonderful book to discuss with a book club. A great book for book clubs or to read on your own. The Unfinished Work of Elizabeth D. will draw you in quickly, and keep hold of you until the end. Highly recommended. I loved the book too! Wonderful job on the review! Mine is up today too, I hope Nichole sells many books,it’s really a remarkable book. Great review—excited to read this! Now I wish I had got this book when I had the chance! Great review! Glad to see you recommend it (I skipped to the end to see if you would). It’s on my review stack for this summer. I agree that this would be a great book club pick!